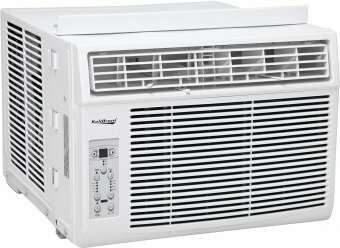 According to Consumer Reports, a 10000 BTU air conditioner should cool an area between 350 and 650 square feet (a figure that should apply to both portable and window 10000 BTU air conditioners), which is essentially equivalent to a large room, two small rooms, or an office for 2 to 5 people (according to most sources). Keep in mind that it also depends on your location. Obviously, 10000 BTU window air conditioners will have a harder time to keep up in southern U.S. States than in Canada. 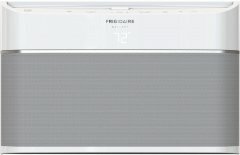 Sitting on the high-end part of the 10000 BTU AC unit spectrum when it comes to aesthetics, the smart-device-compatible Frigidaire FGRC1044T1 has been described by many of its 942 reviewers -- even the ones that gave it unfavorable scores -- as modern and sleek as well as futuristic-looking. Coupled with its chic style, which obviously distinguishes it from most other 10000-BTU-rated units listed here at AlphaChooser, is its remote connectivity feature that's engaged either over a home Wi-Fi network or by using a smart mobile app, a perk that lots of users found particularly useful, since it enables them to monitor the house's temperature, power the unit up in advance while on the way home, and tinker with the AC settings for their dogs, among other things . Frigidaire also throws a classic full-function remote control in the package. A good number of enthusiastic buyers also appreciated its upward-pointing air vents, causing the cold air to be deflected upwards, instead of being blown directly towards people. Also, it scores a comparably-high 12 EER (Energy Efficiency Ratio). Most of this stylish 4.5-star smart air conditioner's 1-star ratings (They made up only 15 percent of its total review count as we were writing this) revolve around its, as one user puts it, incredibly loud operational buzz. On the contrary, some users say that it's very quiet relative to its high 10000 BTU rating -- our tolerance for noise varies, after all. Other users say that it's Wi-Fi connectivity and remote programming either need some improvements or some getting used to, but they did not complain about its actual cooling performance. 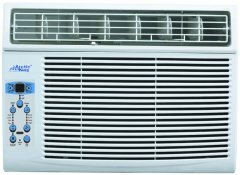 In conclusion, taking into account a grand total of 4949 reviews for air conditioners with 10000 BTU ratings, our review-crawling algorithm determines that the Frigidaire FGRC1044T1 is Alphachooser's best 10000 BTU window air conditioner 2019 (Learn how we rank items), with its modern design concept being crowned by a 100 confidence level (More on confidence levels). 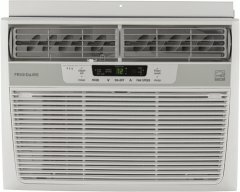 Hailing from the realm of 10000 BTU window air conditioners, the 4.5-star Frigidaire FFRE1033S1 a 19-inch-wide, 14.5-inch high unit offering a 3-pint-per-hour dehumidification rate, an 8-way air deflection system, and a clean air ionizer that promises to remove pollen and other impurities from the air, aiming to provide relief for allergy sufferers. A good number of its reviewers (It gained a total of 1331 reviews as we were writing this) praised its ability to cool relatively large rooms and home office spaces. One particular buyer even gave it a perfect five-star rating for being able to cover two adjacent rooms that are open to each other. After all, 10000 BTU ACs are designed to cool spaces of up to 450 square feet. Many user also loved its full-function remote and temperature-sensing feature. 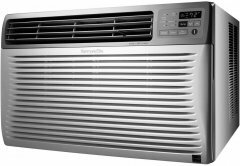 The FFRE1033S1 is also apparently an energy-efficient 10000 BTU window air conditioner, scoring a desirably-high energy efficiency ratio (EER) of 12 -- not something you usually get out of air conditioners of its size. Its $75 annual cost does not sound too shabby either, knowing that a few tantamount units will cost you over $90 annually. Sadly, a few verified buyers found the FFRE1033S1 to be quite noisy, although high-BTU units are not exactly known for their quiet operation. A couple of reviewers were also disappointed that their units broke down after only a few months, while several others noted an annoying tendency of water to pool near the bottom of the AC's frame. The Frigidaire FFRA1022R1 is a window-mounted 10000 BTU air conditioner that offers an Energy Saver Mode (It instantly shuts off when the desired temperature is reached), an 8-way air deflection design, and a washable mesh filter aided by a check filter alert. It comes with a full-function remote control and a 2.7-pint-per-hour dehumidifying rate that's somewhat average, as far as this Alphachooser sub-category of air conditioners is concerned. Although its 10.9 Energy Efficiency Ratio is not that high, knowing that some closely-comparable 10000 BTU window ACs score as high as 12 EERs, some buyers still praised it for cutting down their electricity bills. Several other reviewers (It has a total of 387 reviews, by the way) also applauded this 4-star unit for working better than advertised and keeping their entire apartments -- not just specific rooms -- cool. A good number of them also commended its energy-saving features and 24-hour on/off timer, although these features are by no means rare among 10000 BTU air conditioners. As for noise, one buyer describes its ambient operating sound as average, which is not surprising, given its 58.8dB maximum noise level -- some rivals score only 55dB, while a few others roar with more than 60dB. Its unhappy buyers, on the other hand, criticized Frigidaire after receiving units that broke down after a little under a year. One particular buyer cautioned readers to reconsider purchasing this model after observing that the unit did not drain water, even when leveled correctly, causing water to collect at the bottom of its interior, which definitely sounds hazardous. We also ran into some usual cases of units being delivered with external dents or lose internal parts. 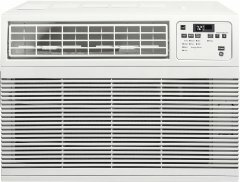 At the end of the day, however, after our review-crawling algorithm scoured 4949 reviews for window-mounted 10000 BTU air conditioners, we can confidently say that the Frigidaire FFRA1022R1 deserves to be an Alphachooser good choice, sitting alongside the top 10 units in this category. Promising to cool rooms of up to 450 square feet (as most 10000 BTU window ACs do), the LG LW1016ER comes with a 2.7-pint hourly dehumidifying rate and a 12.1 Energy Efficiency Ratio (EER), the latter being quite favorable, coming from an air conditioner with its kind of BTU rating -- lower-rated ACs are usually the ones that boast high efficiency ratios. Adding to its efficiency features is its 75-dollar annual cost, which makes the 90-dollar costs of some of its rivals sound way too costly. It measures 14.5 inches high and 23.63 inches wide, dimensions that seem average in this particular AC sub-category. What sets it apart from most of its 10000 BTU rivals, though, is its 52dBA maximum noise level, which is desirably-low, compared to the 58-60dBA noise ratings of several comparable ACs listed here at Alphachooser. 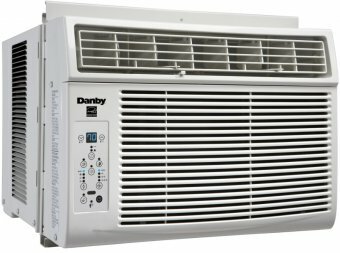 As a result, most of this 4-star unit's 514 reviewers praised it for apparently running quieter than a lot of other energy-efficient 10000 BTU window ACs. Some short descriptions from its enthused reviewers include it being super quiet and not vibrating scarily while cooling a relatively large bedroom. As for its downsides, a decent number of buyers complained about this window-mounted air conditioner's fan. Some groused about its plastic fan not being sturdily built, while a few reported that the fan blade broke off internally after only a couple of months of decent performance. The unhappiest reviewers, however, mention that the units they received arrived broken from the get-go and that the brand's customer support was horrendous, but after giving its reviews a closer look, it seems like this model has a typical mix of bad and good reviews not particularly worse than others in its rank, suggesting that these experiences may have been exceptions. 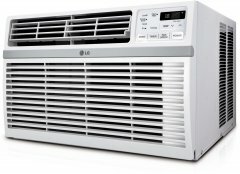 In any case, we sent off our shopping algorithm to aggregate a total of 4949 reviews for 10000 BTU air conditioners and it came back with this verdict: The LG LW1016ER is an Alphachooser good choice and it certainly belongs to the top 10 models in this category, but it's not exactly the best. A very close cousin of Frigidaire's FFRE1033S1 model, the Frigidaire FFRE1033Q1 is a window-mounted air conditioner whose 10000 BTU rating makes it fit for bedrooms or living rooms of up to 450 square feet, although many of its 774 reviewers use their units to cool rooms that are significantly smaller. Like several other models in its category, the FFRE1033Q1 comes with a clean air ionizer for removing pollen and other allergens out of the air. It has a 3-pint-per-hour dehumidifying rate and it comes with directional air vents, the latter being a point of complaint for a couple of users, who say that the vents do little to change the air direction. Averaging a rating of 4 stars as of this AlphaChooser write-up, the FFRE1033Q1's most-apparent strength is its ability to, as one user puts it, turn the room ice cold. A few reviewers also like that their electricity bills did not hike that much after getting this model. It does, after all, boast an EER (Energy Efficiency Ratio) of 11.3, which is appreciably-high, coming from a 10000 BTU window air conditioner. On the other hand, although there were not that many complaints about its actual ambient noise as we were writing this, its 60dB maximum noise level sounds (pun intended) like it's something to watch out for, knowing that most other units in this list have noise ratings of only about 56dB. The majority of its critical reviewers talk about units that stopped working within the first year of purchase, after a several months, or even after only a few days. That said, the fact that there weren't many complaints about its actual performance is probably a silver lining. 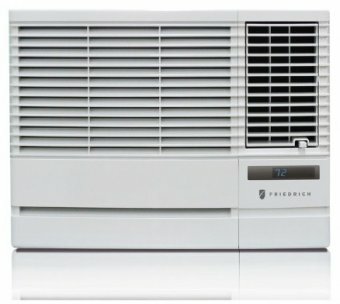 All said, our shopping algorithm, which went through the trouble of analyzing a total of 4949 reviews for 10000 BTU window ACs, concludes that the Frigidaire FFRE1033Q1 is undoubtedly worthy of a spot alongside the top 10 units in this category. In fact, it's an Alphachooser good choice. 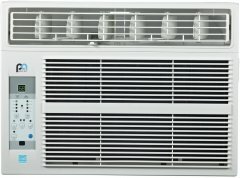 The Frigidaire FFTA1033Q1 is a high-capacity 10000 BTU air conditioner that many buyers claim to be relatively quiet for an AC unit with its BTU rating, although it is only marginally quieter than its FFTA1033Q2 sibling (This one has a 57.3dB maximum noise level, while the Q2 has a 58.5dB rating. However, a few other models in this AlphaChooser list only put out up to 52dB of noise). This 3.5-star Frigidaire unit also apparently does what it sets out to do with ease, with one particular user saying that it cools an entire home floor and that it is quite easy to install . Another satisfied buyer highlighted the accurate temperature reading on its full-function remote control, while some reviewers called it a lifesaver and noted that it is not that expensive for something that puts out a 10000-BTU performance -- it was pegged at around 664 dollars at the time of writing. Sadly, this 10000 BTU window-mounted model drew some negative feedback for what a few users say are flimsy parts -- we saw a case where the compressor blew out after just a month. It also had its fair share of grievances about its operational noise, despite most of its reviewers saying that it is fairly quiet, with a couple of buyers claiming that it is very loud. However, the numbers are on the FFTA1033Q1's side on this case, since 61 percent of the 117 reviews we checked out gave it 5 stars. 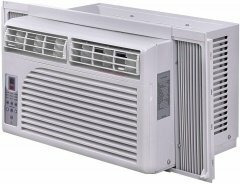 So, turning to our review-crawling system, which went through the trouble of reading through 4949 reviews for 10000-BTU ACs, we can ascertain that the Frigidaire FFTA1033Q1 is an Alphachooser interesting choice. In other words, it is among the top 10 10000-BTU air conditioners on the market today.